The Suitcase Tombstone in Lincoln, Kansas, was featured in a 1933 "Ripley's Believe It or Not!" cartoon, and in a 1984 issue of the Lincoln Sentinel-Republican. 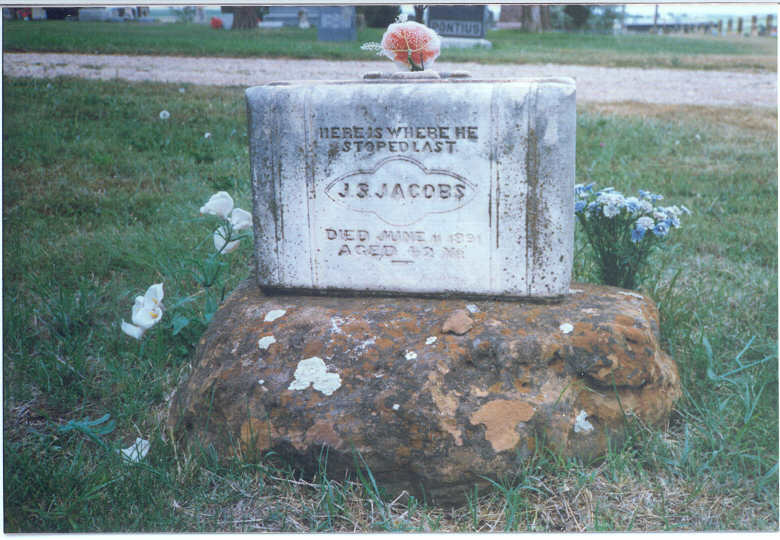 The latter article offered the findings of local attorney Walter Urban, who had concluded that the stone—dedicated to J. S. Jacobs and depicting a satchel with the inscription "Here is where he stoped [sic] last"—was erected by local businessmen for a "salesman" whose "parents simply did not believe in putting up headstones." A tombstone has just been erected in the cemetery in Lincoln, Kan., which, for unique design and applicable inscription, probably has no equal in this country. James Jacobs, a Lincoln butcher, died in 1891. His father, Henry Jacobs, is a very eccentric fellow. The old gentleman several months ago concluded to erect a suitable tombstone over the grave of his son James. He wanted something out of the ordinary. He remembered that James was of a roving disposition, so he had a stone cut in the shape of an old-fashioned traveling satchel. On the plate in the center of each side is the name "J. S. Jacobs." Just above the name is the inscription: "Here is Where He Stopped Last." Underneath the name is the date of death and his age. The stone is white marble and the base is a big boulder which the father hauled from his farm and rolled on the grave. When questioned as to why he chose such a unique design the old gentleman said: "Wall, Jim, he were a sort of a rovin' feller, and I allowed that this design would 'bout suit him. He never stopped very long before in any one place. But the last time I see him he were at the graveyard, and I jes' concluded that he might stay thar a long while. So I had a sign printed on ther stone sayin' whar he was last seen and whar he ought to be now." There's no reason to fear the ghost of J. S. Jacobs. The ghost of his father, on the other hand, will track down and dismember anyone who touched his son's tombstone as a child.